Benzie County Visitors Bureau - Things to see and do in Benzie County. 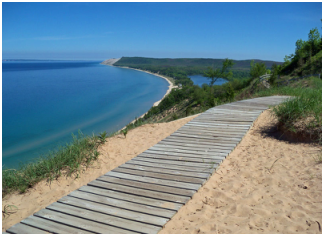 Sleeping Bear Dunes - Start here to plan your trip to the park. MyNorth - Good site for greater Grand Traverse Bay area. Path to the Platte River - Marked deer trail starts at the back of our backyard. About 250 yards south to your own quiet spot on the river. Jomos Ice Cream - Good food and great ice cream right next door! Jim’s Joint - Great BBQ in downtown Honor. Riverside Canoe Trips - Canoe, Kayak and Tube rentals plus a great general store to outfit yourself for your adventure. (231) 325-5622. Interlochen Center for the Arts - Concerts and plays throughout the summer. Beautiful outdoor setting. Big names often stop by to play. Honor Family Market - Great meat department and a good beer, wine and liquor selection. In the Honor Plaza on the west side of Honor. Shell Station/Convenience Store - 1/2 mile west on Main toward Honor. Open 24/7.